I'm not much of a watermelon guy. It's not some I hate or anything but even as a kid when handed a slice it wasn't really my thing. Between the weird stickiness that got everywhere and having to deal with spitting out seeds it just seemed there was too much effort involved with very little reward. My lady, on the other hand, is a fan. Whenever she picks some up at the store she always offers me some but for the most part I pass. 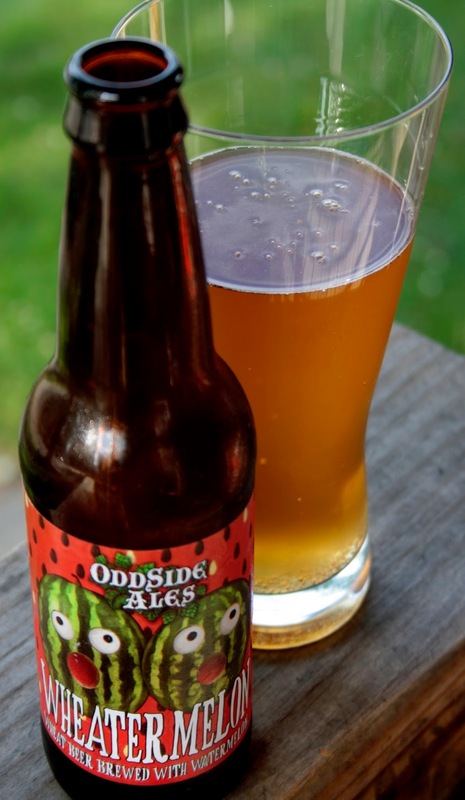 One of the many things her and I do have in common though is being fans of Grand Haven, Michigan brewery Odd Side Ales. When they announced that bottles of their wheat beer brewed with watermelon would be hitting the store shelves for the warmer months this year she would give me the occasional reminder to keep an eye of for it. Eventually I did spot some around. I hemmed and hawed a little bit about picking some but knew, even with me not being in the water melon fan club, bringing some home would make for a happy lady. Pouring hazy orange with a reddish tint in color it looks like summer. The head was very minimal and faded fast but there was a little ringleft that stuck around for the most part through the entire glass. Not much as far as lacing was concerned. The smell was sweet and summery. Not really blatant as far as the watermelon was concerned but generally fruity. The aromas of fresh baked bread and a hint of banana that is usually typical in a wheat beer was there. Though the watermelon wasn't pronounced much in the scent it does make it's presence known on the first sip. The thing is though it didn't have me making the "Meh!" face the way watermelon usually does. It wasn't over the top and bursting with that musky weirdness but it did serve its job of being more than just an flavor accent it. It, along with notes of lemon and seasonal fruits like strawberries, gave the beer a fresh summer salad type of tartness without taking over and overshadowing the wheat beer base. It finishes clean. If you're seeking out some big fruit and booze bomb of a beer like a Short's Soft Parade, the subtleness of the flavors and a 4% abv of this is not going to make that list. For something crisp and refreshing to slip while hanging out in the sun (now that summer seems to have finally arrived here in Michigan) this fits the bill just fine. Joan Dovalle "No Better For You"